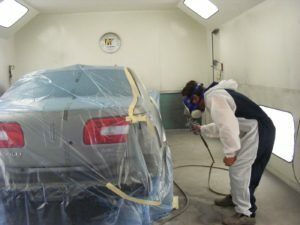 We have a fully equipped, professional collision repair center. We work with all insurance companies. Let us be your repair shop of choice. Insurance companies cannot steer you to specific body shops, or require you to get multiple estimates. Stop in for a free professional estimate while you wait. Is your vehicle undrivable? We can tow it in for you. Call in to arrange a vehicle pick up. Outside towing services can also drop off your vehicle at any time of the day or weekend. For vehicles left after our business hours, the keys should be left in our drop box with a name, phone number, and repair information. Our drop box is located next to our service entrance door on W. Willow St.
We offer full glass replacement.